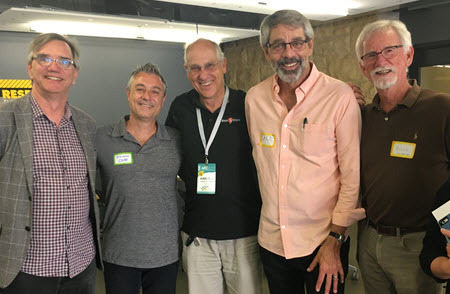 Left to right, Stanford Professor Bill Burnett, CSU Dominguez Hills Professor Giacomo Bono, Stan State Professor Harold Stanislaw, Stanford Professor Dave Evans and Stan State Professor Bruce Hesse. Around 45 participants from 14 universities, including Stanislaus State psychology professors Bruce Hesse and Harold Stanislaw, gathered at Stanford University last week to examine a unique problem-solving method with very real applications for college students. The workshop, called “Life Design Studio for University Educators,” is based on the concept of Design Thinking, a team-based approach to solving complex challenges by focusing on finding multiple beneficial and sustainable solutions from the viewpoint of the person with the problem rather than attempting the journey through the implementation of tried and true procedures. According to Hesse, the method begins when the team accepts the fact that there is a problem, then approaches the solution from the viewpoint of the person with that problem. The institute hosts, Stanford Professors Bill Burnett and Dave Evans, have applied this sequence of discovery in a way that helps students think about their future career paths. Through the Stanford Life Design Labs, which Burnett and Evans founded, students are finding that examining opportunities ahead of them using the Design Thinking method can relieve many post-college anxieties. Stanislaw found additional value in how the material was presented at Stanford, using teaching methods that he believes could be useful in his own classrooms. Burnett and Evans have taught a very popular course on the subject at Stanford for 10 years. Several years ago, while Stan State President Ellen Junn was provost at San Jose State and then CSU Dominguez Hills, she was interested in looking at innovation elsewhere to promote student success. She took two professors to watch a Design Your Life course led by faculty at Stanford. These Dominguez Hills faculty members were interested in exploring the creation of a similar design thinking course for psychology majors, which is the second largest major on that campus. A course at Dominguez Hills did emerge and was taught during the 2016-2017 academic year with great success. Junn, who urged Stan State professors Hesse and Stanislaw to attend the Stanford institute last week, is hoping a similar course eventually can be offered here. “I’m so pleased that the relationship I started between faculty and this Stanford institute while I was at Dominguez Hills is continuing and has spread to Stan State,” said Junn. “Our faculty’s experience with this training will be an invaluable asset to our programs and students, especially the first-gen students who may need extra guidance as they step into their careers. In addition to Stan State and Dominguez Hills, participants came from Cornell, Dartmouth, Harvard, MIT, The New School, Southern Methodist, Trinity, UC Berkeley, Dayton, Michigan, Williams and Yale. Data and findings from the seminar are just beginning to be disseminated and unpacked, but, as pointed out by Stan State Psychology Department Chair William Potter, the potential impact of Design Thinking concepts at Stan State is significant.